(3) Renter Household (HH) Percentage is based off Census estimates with internal ABI projections as follows: 2011=36.0%, 2012=36.4%, 2013=37.3%, 2014=38.2%, 2015=38.8%, 2016=39.2% (est), 2017=39.6% (est), 2018=40.0% (est), 2019=40.4% (est) and 2020=40.8% (est). (4) Units Deliveries for 2017/18 are based on projects currently Under Construction as of 2Q 2017 (332 units, 50+ unit properties) with delivery expected by end of 2018. For 2019/20, projects currently Under Construction with deliveries set through 2020 + assuming that 100% of all Planned units as of 2Q 2017 (826) will be completed by 2020 as well. From 2011 to 2016, demand exceeded supply by approximately 300 units. Based upon current delivery schedules (50+ unit properties) and the lower bound population growth estimates provided by the Arizona Department of Administration, apartment unit demand will continue to outpace supply well into 2020, rising to a 1,700 unit deficit for the entire time period. The MSA's total sales volume (10+ unit properties) increased 167%, year-over-year, to $168.95M across 44 transactions representing 2,263 total units sold. California-based investors continue to be the dominant buyer of multifamily properties in the area accounting for 34% of total units transacted or 772 units, Arizona-based investors came in 2nd with 540 units purchased and, rounding out the top five: (#3) Florida-investors with 455 units purchase, (#4) Massachusetts-based investors with 274 units and (#5) Nevada-based investors with 141 units. Sales of 100+ unit properties witnessed a sales volume increase of 117% y-o-y to $95.9M. Average price-per-unit amount increased 25% to $81,122. 10 to 99 unit properties saw its volume increase an astounding 283% to $72.9M with a surge of 101% in average price-per-unit amounts to $67,578. Price-per-unit increases in the smaller property size category dovetails the sales trend which began in earnest in late 2016 through 1Q 2017, as mid-century built, extensively repositioned properties in the Central Tucson/University submarket having been coming back online for sale. In fact, pre-1980's built product represented 74% of all transactions in the 2Q. The Tucson MSA did not have any new inventory come online in 2Q. In fact, Tucson will not see any new construction until the end of 2018, aside from smaller affordable housing developments. Despite a minor (0.2%) Occupancy Rate contraction to 94.4%, Tucson's Occupancy Rate is projected to increase to 95% by year end. Average rent continued is rise increasing 3.8% y-o-y to $794. With many of the larger western MSA's reaching, and exceeding, previous peak price per unit amounts has caused investors, on the hunt for higher yield/CAP rates, to look to qualified secondary and tertiary markets. Tucson with little in the development pipeline, is fast becoming the ‘go-to' secondary market for multifamily investors. Given Tucson's now 5-year low for projected new unit deliveries and with economic and job prospects at, or nearing, 7 year highs lays the foundation for a market not witnessed by Tucson investors in at least a generation, if ever. 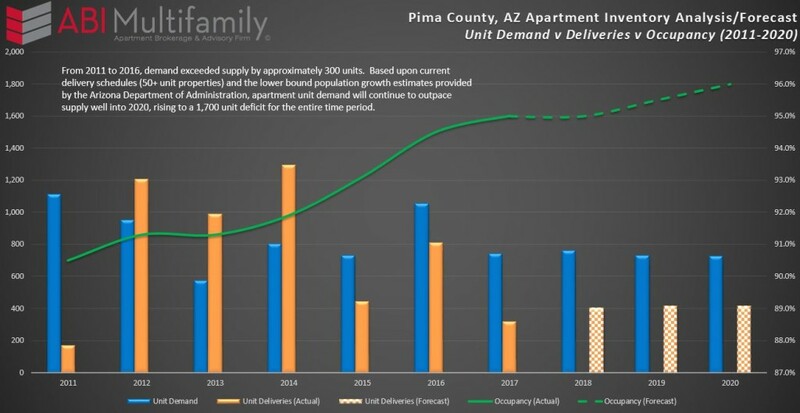 The confluence of these two conditions will continue to shape the Tucson multifamily market well into the latter half of 2018 as new units will be brought online. Until that time both, and barring any Black Swan events, Occupancy Rates and Rents should continue to reach all-time highs and make Tucson one of the more active secondary markets in the county.